The head of one of Canada’s most prominent environmental groups said the green movement is facing a “chill” in the wake of increasingly harsh scrutiny from Ottawa. 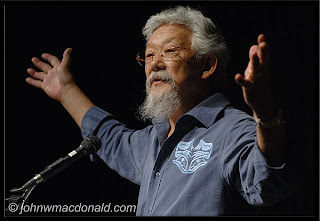 Peter Robinson, chief executive officer of the David Suzuki Foundation, said the group is being extra careful to stay strictly within its mandate and has pulled back from important issues that might push the boundaries of advocacy. He said newly budgeted federal money for audits is “almost a vague threat” that is making charities nervous. The Conservative government and other supporters of the oil sands and a proposed pipeline to the West Coast have long questioned the motives and patriotism of environmentalists who accept money from foreign donors. And the green movement says it had been feeling a rising tide of negative attention since before the budget. The negativity was such that Mr. Suzuki has distanced himself from the board of the foundation that bears his name, worried he was bringing down criticism on the group. The long-time environmentalist, now 76, said Thursday he had felt he needed more freedom to speak his mind. In the federal budget, Ottawa mandated more information from non-profit groups “on their political activities, including the extent to which these are funded by foreign sources.” The government has found $8-million over two years at the Canadian Revenue Agency for “education and compliance,” which includes money for extra audits to ensure charities follow the rule that no more than 10 per cent of funds can be spent on advocacy. Natural Resources Minister Joe Oliver had earlier launched an attack on what he called radical, foreign-funded environmental groups. His attack came after a 2011 campaign by Ethical Oil, a pro-industry lobby group that has close Conservatives ties, including founding member Alykhan Velshi, who now works in the Prime Minister’s Office. The lobby group noted that several U.S. and European foundations had made large donations to Canadian environmental charities, in some cases with the express purpose of opposing oil-sands development and the Northern Gateway pipeline. In an open letter issued in January, Mr. Oliver slammed groups that “use funding from foreign special interests to undermine Canada’s national economic interest” by opposing resource development. In the run-up to the budget, the minister crisscrossed the country, giving speeches that promoted the need for pipeline access to the West Coast and continued to slam “radical” groups that opposed it. Meanwhile, Conservative MPs and Senators held hearings in which they criticized environmental groups and accused them of abusing their charitable status by advocating against the oil sands generally and the Gateway pipeline specifically, and by tapping foreign money to influence the Canadian debate. Mr. Robinson, in Toronto with Mr. Suzuki and foundation chairman Jim Hoggan, said that extra scrutiny of charities has made them pull back on serious issues, particularly if a strong statement might blur the lines of advocacy. He pointed to a right to a healthy environment as an example of “an important conversation” being prevented. Mr. Robinson added that the Suzuki Foundation remains well within the limits on political activity, saying its work is research oriented, rather than political. This entry was posted in Organizing and tagged War on greens. Bookmark the permalink.